Tortilla & Pancake Warmer Plastic Large 9"
Tortilla & Pancake Warmer 9" x 2.5"
Red Color available now. Microwave safe. Dishwasher safe and durable. Thermally insulated, keeps tortillas soft and tender. Place hot food in container to retain heat during meal. Place frozen tortillas over paper cloth towel in container with lid off. Follow your microwave cooking instructions for preparation time. Remove at specified time and relace lid to keep food hot. Caution: Do not place container on stovetop or in oven. 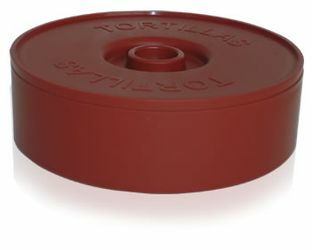 Tortillero para conservar hot cakes y tortillas calientes. Great product, I especially like the deep red color. These make great snack bowls as well.